Palestinians and right groups condemned a decision by an Israeli court that gave the green light for the military to demolish a Bedouin village in the occupied West Bank, forcibly evicting 180 residents there. In a statement on Wednesday, the Ramallah-based Palestinian Authority said the decision to raze the Khan al-Ahmar village consolidates Israel’s “colonial project” of building “an arc of settlements” that effectively cut off occupied East Jerusalem from the rest of the West Bank. “This illegal decision uncovers the colonial DNA of Israel’s institutions that work to confiscate Palestinian lands … effectively alienating it from the West Bank and killing any hopes for a future contiguous Palestinian state,” it said. Khan al-Ahmar is situated a few kilometres from Jerusalem in the middle of two major illegal Israeli settlements, Maale Adumim and Kfar Adumim, which the Israeli government wants to expand. 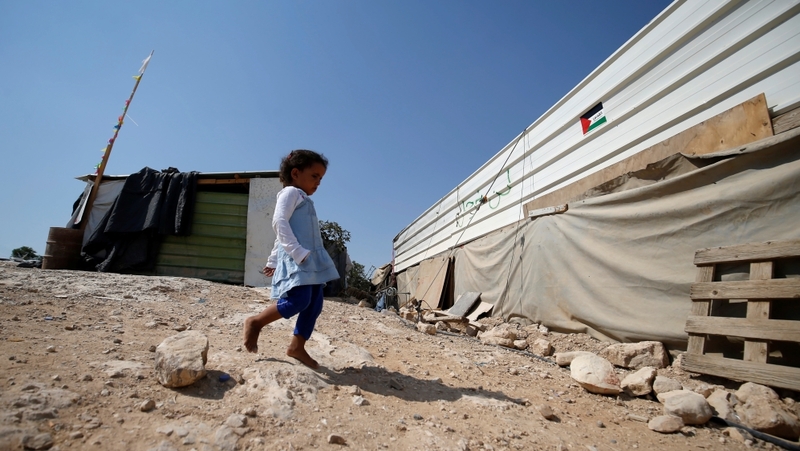 The removal of the Bedouin village enables the Israeli government to cut the West Bank in two. Israeli Defence Minister Avigdor Lieberman praised the justices’ decision on Twitter calling it “brave”. “Khan al-Ahmar will be evacuated. I congratulate the Supreme Court judges for their brave decision. Nobody [is] above law. Nobody can prevent us from consolidating our sovereignty,” Lieberman said. The small community of 40 families live in tents and shacks on what is classified by the 1993 Oslo Accords as Area C, which accounts for 60 percent of the West Bank and is under total Israeli administrative and security control. The court’s decision was largely based on the premise that the village was built without Israeli permission, which Palestinians say is impossible to obtain because of the expansion of illegal Jewish-only Israeli settlements there. Hagai El-Ad, director of Israeli rights group B’Tselem, told Al Jazeera the court’s ruling was “cowardly, immoral, and outrageous”. “This decision only demonstrates the Israeli High Court is working not in the service of justice but is simply working in the service of the occupation,” he said, speaking from Jerusalem. El-Ad said displacement and settlement expansion have been the policy of many Israeli governments but the current one “is acting with a glaring green light that it sees from Washington”. In response to the court’s decision, the Palestine Liberation Organization (PLO) organised a demonstration in Khan al-Ahmar on Wednesday. “We are holding this sit-in today to show solidarity with the people of Khan al-Ahmar and pressure Israel to reverse its decision,” Walid Assaf, head of the PLO’s commission on settlements, told reporters there. El-Ad called on the international community to act, saying it has the responsibility “to safeguard human rights anywhere”. “Especially in this reality where Palestinians have been living for more than half a century under a military occupation that desires to advance settlements and displace Palestinians – a process that is happening in broad daylight,” he said.